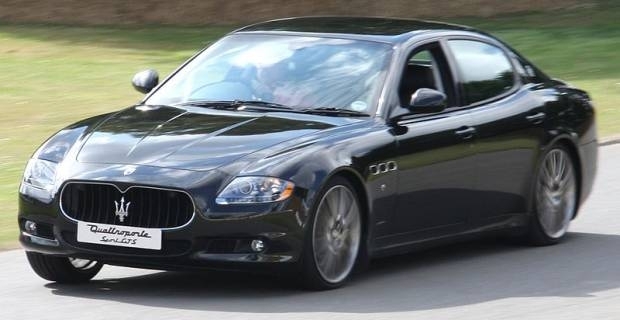 The Maserati Quattroporte, meaning four door Masserati, is a luxury saloon. The current car is the fifth generation of a model that was introduced in 1963. Today Maserati produce three models: the Quattroporte, the Quattroporte S and the Quattroporte Sport GT S. Each can achieve 0 to 60 mph in less than 6 seconds and reach a top speed of over 165 mph. Power is developed by a V8 engine with a capacity of either 4.2 or 4.7 litres. Whether you will be travelling in the back of the car or sitting behind the steering wheel, the Quattroporte offers something other cars can’t: the comfort of a limousine and the performance of a sports saloon. The Bentley Continental Flying Spur can match the Quattroporte for refinement and might even keep up with it on the track, but can it match the Italian styling? Cars produced by manufacturers like Audi, BMW, Mercedes and Jaguar may be able to match the Quattroporte all departments, but do their brands carry the same prestige as Maserati? For decades the Trident marque has been synonymous with passion, pride, refinement and performance. Throughout that time their flagship saloon has remained a symbol of the company’s commitment to its heritage, combining the hallmarks that make Maserati the desirable brand it is today. The Pininfarina styled car is both luxurious and powerful. It’s a sports saloon to rival the Panamera and the BMW M5. At £82,000, it’s over £20,000 more than the entry level Porsche Panamera and £9,000 more than the BMW. But with a brand that challenges Ferrari and Lamborghini for prestige and desirability, the little extra is money well spent.